This is a pastel yellow polka dot design wooden plaque with wooden teddy bear motif. It measure 15cm x 10cm and is finished with twine and pastel yellow & white gingham ribbon. 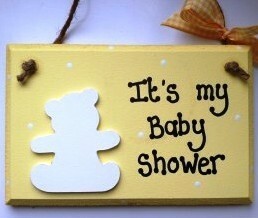 Oh so cute and ideal to hang on the entrance door to let all your guests know where the baby shower is taking place.